Christianity Today chat with David Oyelowo about his leading role in the highly anticipated movie, Selma. Oyelowo plays Dr. Martin Luther King, Jr. at the time he led the march from Selma to Montgomery during the Civil Rights Movement. And while Oyelowo’s career does thrive off acting, he attributes his faith to allowing him to deeply connect with a character of that caliber who shared the same faith. Neither were shy in their beliefs. “There’s a point in the film where there’s a speech I give from the Capitol set right at the end of the film and the production designer had put a lectern there for me to do a speech from. And he just didn’t feel it was right—it felt like Dr. King should be doing that speech from a pulpit. 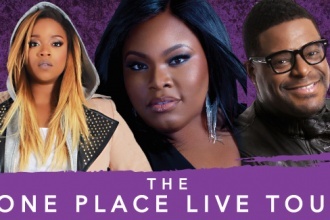 One Place Live: Tasha Cobbs is Going on Tour! Tasha Cobbs is hitting the road this fall to headline her “One Place Live” tour with Kierra Sheard and William Murphy.